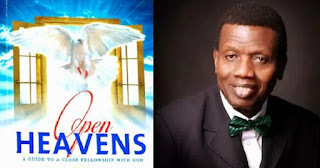 Open Heaven [11 May 2018] Spiritual Sensitivity - Open Heavens Daily Devotional Messages, By Pastor E.A Adeboye. In the physical realm, sensitivity can be viewed from the perspective of a deep feeling of love and compassion for a person, which usually translates to a commensurate level of understanding for that person’s needs, leading to appropriate actions being taken in that person’s interest. From this verse, we understand that spiritual sensitivity is a grace that comes from living under the control of the Holy Spirit. Are you spiritually sensitive? Our Lord Jesus Christ manifested this nature in John 4:17-19 and in several other passages of the gospels. Because we are fashioned after Him, we ought to walk as He walked. Spiritually sensitivity was Jesus’ lifestyle, and so, any Christian that is not spiritually sensitive will not walk in the reality of the abundant life that he or she processes. Open Heaven [11 May 2018] Spiritual Sensitivity. Without spiritual sensitivity, a person is bound to depend on suspicion, natural intelligence, educational awareness and the natural senses. These are all deficient in receiving the things of God. Without spiritual sensitivity, Abraham would have missed his blessing and the opportunity to save Lot and his family from destruction (Genesis 18:1-33), Samson’s parents would have missed a wonderful chance of a lifetime (Judge 13:3-25), and the great Prophet Samuel would have anointed the wrong person as king over Israel (1st Samuel 16:4-13). Open Heaven [11 May 2018] Spiritual Sensitivity. When decisions are made based on physical evidence alone, no matter how incontrovertible the evidence may seem, there is still always the possibility of miscarriage of Justice. This has wrongly sent people to prison and even death. I pray that your spiritual sensitivity will become sharpened today in Jesus’ Name. Father, I want to be vibrant for YOU; please set me on fire for You today in Jesus’ Name.